Conroy Gold and Natural Resources plc (AIM:CGNR), the gold exploration and development company focused on Ireland and Finland, is pleased to announce that its 2019 drill programme will commence shortly on the 65 km (40 mile) gold trend that the Company has discovered in the Longford-Down Massif in Ireland where the Company has, at Clontibret, a JORC resource of 517,000 oz Au and estimated in the overall Clontibret, Clay Lake, Glenish area, an Exploration Target of a further 8.8M oz Au (as previously announced by the Company on 2 August 2018). The 2019 drill programme will initially focus on the South Western, or Slieve Glah area, of the gold trend, approximately 40 km southwest of Clontibret. This is both to follow up on encouraging deep overburden and trenching results and to fulfil work commitments on the relevant licences. At Slieve Glah the Orlock Bridge Fault, a major geological structure along which the gold trend lies, undergoes a significant strike swing. Such strike swings can act as focal points for mineralisation and gold-in-soil geochemistry suggests that there are a series of large (3km long) gold targets. 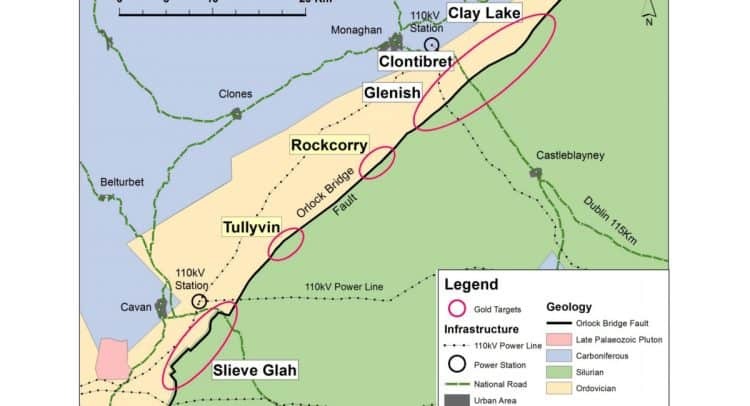 Slieve Glah is regarded by the Company as a large and very promising target area which adds further to the prospectivity of the Company’s 700km2 licence area. Conroy Gold is also pleased that the Company’s booth at the 2019 Prospectors and Developers Association Conference (“PDAC”) attracted a high degree of interest from representatives of the mining industry who were not only made aware of the Company’s major gold prospects in Ireland but also of the Company’s openness to joint venture discussions. The Irish Minister for Mines, Mr. Sean Canney T.D., who attended the Conference, visited the Company’s booth accompanied by members of his department. Minister Canney confirmed the Irish Government’s positive attitude towards mining. Ireland now ranks 4th for mining policy perception in the prestigious Fraser Institute Ratings. “Following on from the excellent results of the 2018 drilling programme, I look forward to the new 2019 drill programme.